In a continued effort to highlight the many outstanding performances by drivers around the country, eKartingNews.com is proud to introduce the ‘Driver of the Month’ program. Each month, the staff at EKN will determine the one driver who stood out above the rest and give the viewers a chance to know exactly what they accomplished and who they are. The Junior category at the Superkarts! 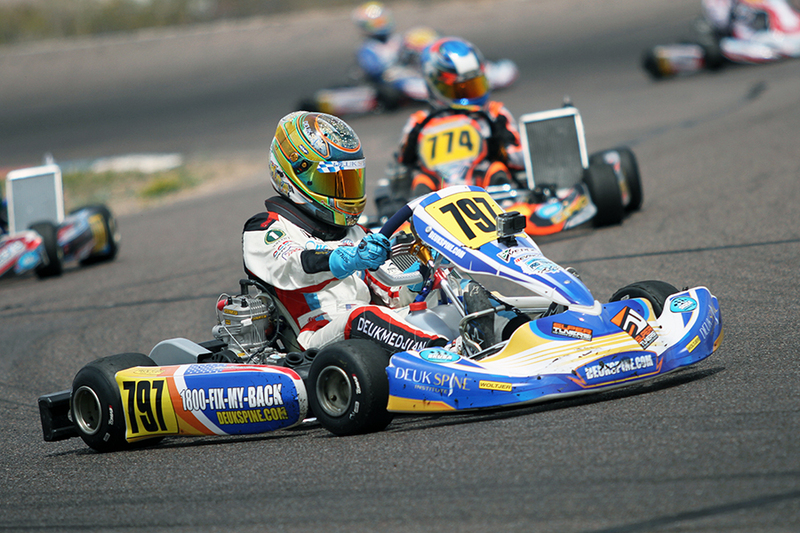 USA Pro Tour has been developing stars of karting and motorsports since its inception. In recent years, the names of David Malukas, Brandon Lemke, Alex Bertagnoli and Dylan Tavella have conquered the championship and each continue to impress behind the wheel in their respective programs. A new name is set to join this list as the SKUSA Pro Tour will wrap up in August at the SummerNationals. Those who are vying to be the next champion had to get through the SpringNationals at the Phoenix Kart Racing Association. The one driver to walk away with both wins in the desert was Florida driver Arias Deukmedjian. The LEM / Tony Kart driver shined in both main events during the ninth annual SpringNats in Glendale, Arizona. Battling against a solid field of 44 drivers and record high temperatures, Deukmedjian handled the situation with cool composure and consistent laps in the Finals to reach the checkered flag first. Saturday’s action began with Arias sitting sixth after qualifying. He was shuffled back to ninth early in the Prefinal, fighting his way up to fifth for the inside row three starting position in the main event. A great start put him second behind fellow Florida driver and 2016 SuperNationals winner Tyler Gonzalez. 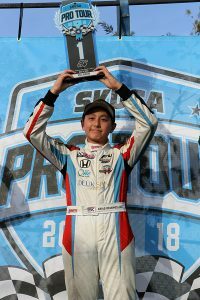 Working past Gonzalez on lap 16, Arias kept laying down the laps to establish a 1.3-second advantage and secure his first SKUSA Pro Tour victory. The following day was very similar. Deukmedjian was classified eighth after the qualifying session, with the top-10 separated by only three tenths of a second. Arias was the quickest driver in the Prefinal, which was cut short to nine laps after a red flag. He advanced forward to the second spot, where he would finish and earn the outside row one starting position for the Final. Some heated racing early on with Tyler Maxson and Jeremy Fairbairn eventually led to Arias securing the lead on lap six. A red flag with ten laps to go bunched up the field with Deukmedjian leading the single-file restart. Arias fended off the challenges and ran away to a 2.776-second advantage for his second victory of the weekend. The two wins along with the podium finish at the WinterNationals has helped to put Arias at the top of the Superkarts! USA Pro Tour X30 Junior championship lead. His advantage is 61 points over Fairbairn with WinterNationals winner Matheus Morgatto sitting third. Gonzalez, Maxson and Canadian Justin Arseneau remain in the fight, with every session meaningful at the New Castle Motorsports Park on August 10-12. Engine/Engine Builder: IAME = Woltjer Racing Engines, OKJ = TM, TK and Fred Deting, ROK = OGP/Mario. How did you get started in karting? Electric toy cars since I was one year old and at 7 my parents brought me to the Orlando Kart Center where I met Tito Zanella who became my first mechanic and coach. Ariel Castro saw my potential as a driver and took me under his team AM Racing. Over the years I have had many great coaches including Greg Bell, Paul & Jay Howard, Mike & Alex Speed, Suzie & Mikey, Naka, Mike Contreras, Marcie and of course my father. What has been the high point in your racing career? Being a competitive kart racer on the European circuit. What are your goals in racing? My immediate goal is to win the OK World and European championships and someday in F1. In a few words, how would you describe your driving style? Smooth and fast. Funniest moment at the race track? The first time our RV was “pumped out” at the race track. What do you do when not at the track? High school student, practice viola and guitar, play on the JV soccer team, Tae Kwon Do, gaming, study for the SAT, read books and play with my dachshund, Sebastian. What are your goals outside of karting? To be accepted to Cambridge University with a full scholarship and race formula cars in Europe. What are your pet peeves or things that irritate you? Biased race directors and people that drink and drive. What do you think could be done to improve the sport of karting? Karting should be a more prestigious sport and not just a step up to a more recognized sport like cars. What are your favorite aspects about the sport of karting? A strong level of competitiveness throughout the world.